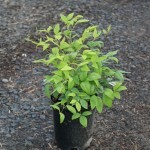 A compact, mounding shrub with bright lime-green foliage that becomes glowing red in the winter. Prefers full sun, with normal moisture. Useful in groups, as an edging or in containers.